Wanted to expand on that a little, here. Lately we’ve been hearing a lot about kids and guns. If you know me, you know I have five not-so-little credentials in this area. 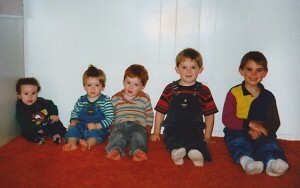 My five sons are all young adults now, but it wasn’t that long ago that we had a houseful of closely-spaced, very curious, very active, very normal young children. And, of course, we have owned guns for most of their lives. Would you trust these faces? So when I talk about working yourself out of a job as a parent, protecting your kids by preventing unsupervised access and also by educating them about how to be safe in a dangerous world, you know it’s something I really believe. Guess I can blame my own parents for some of that. For example, my siblings and I grew up in a house that had a backyard swimming pool. My parents would never have moved into that house, or allowed their children to live in a house with a pool, unless they’d first taught us how to swim. But we all knew how to swim from the time we were very small, because the world is full of lakes and rivers, beaches and streams and ponds and yes, pools. Even before we moved into that house, my parents put a high priority on making sure all of us kids were safe around deep water, because they knew deep water could be deadly. They did teach us never to go near water without permission, and they did keep the pool gate locked—but they also taught us how to swim. Not that my parents were always on top of the safety-education thing. Here’s another event I remember from childhood: When I was five or six years old, I set a friend’s bedroom on fire by throwing a blanket over a lamp to make a “spook house.” Nobody had ever taught me that putting a blanket on a lamp was a dangerous thing to do. If they had, I sure wouldn’t have done that! The fire, and how it started, really scared the snot out of me. No, I mean, it literally did – I sobbed for days, and if you’ve ever seen a six-year-old girl sobbing, you know that’s going to involve a whole lot of snot. Even now, I still remember the horrible knot that I had in my stomach afterward, because I didn’t know how to not start that fire. And I hadn’t known what to do about it when it did start. That experience, and others like it, really stayed with me when I had kids of my own. As a mom, I’ve always believed that kids aren’t stupid and they aren’t evil. They’re simply ignorant. The longer we let them remain ignorant, and the bigger they get before we educate them, the more trouble (and the more serious the trouble) they can get into. When we start their education early, we can save ourselves and them a lot of potential grief. As the world’s clumsiest child, I learned early that water can suffocate you, sharp things can cut you, solid things leave bruises, and hot things can burn. My parents did their very best to make sure I learned those things without drowning, and without needing stitches, casts, or burn ointment. And for the most part, they succeeded. Mom taught me how to use a kitchen knife and Dad taught me how to whittle the end of a stick for roasting marshmallows when we went camping. They didn’t teach me how to do those things because they thought knives aren’t dangerous; they taught me how to do them because they knew sharp knives are dangerous. Even though it meant I would be handling a dangerous object, my parents believed that even for a child, ignorance is far more dangerous than knowledge. I carried that idea over into my own child raising experiences. So I was the kind of mom who went outside and actively taught my kids how to use a magnifying glass to set a dry leaf on fire. Why? Because if there’s a magnifying glass in the house, the kids are going to learn how to do that little trick anyway. But when I taught them how to do it, I also taught them to always keep a bucket of water next to them just in case they needed it. Because I knew I wouldn’t always be there to keep them safe, I worked hard to teach them how to keep themselves safe. That’s a very basic job for any parent. Firearms are no different than swimming pools, electricity, sharp kitchen knives, and magnifying glasses. Children live in a world where these things exist. Someday, sooner than you think, they will visit friends’ houses where guns (and everything else you hope they’ll never get into) might be easily available when you’re not around. When that day comes, if you have taught them well, they will know how to keep themselves safe.